David Pendleton, Associate Fellow Saïd Business School and of Green Templeton College, Oxford; & Adrian Furnham, University College London. 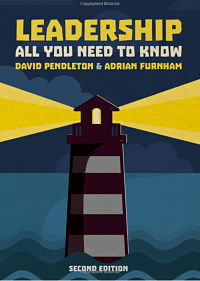 “.. Pendleton and Furnham present an innovative model for leadership success in a turbulent world. “When times are hard, leadership makes the greatest difference. This thoroughly updated second edition shows how to make the kind of difference that all organizations, both public and private sector, want and need. “Early chapters show the powerful effect leadership can have on organizations; subsequent chapters present new ideas that are elegantly simple, conceptually coherent and radically different, based on the best research in the field. The ideas in this book have also been tested in major multinational organizations over recent years.